Scuttle enemy means sink the pirate and do not have high special requirements, for you to take the job. You can see what is required to take the job, by clicking it. The ship class of the jobs, depend on the city’s highest job ship class a list is here. But if your flag ship is a lower ship class then the city’s job ship class, four to five jobs, with that ship class will also be available. You need to sail six miles or more away from the port you took the job, for the scuttle job to appear, It will be a pirates with green [ ] around its name, indication it is your job. Scuttle enemy give high amount of gold. 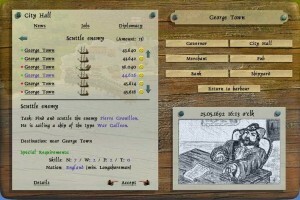 Note that if you make a scuttle job into a ghost ship, then sink it by shooting it and you will still complete the job. Also if a scuttle job runs away, you will fail the job. Hint: using a ship class with more firepower, will make it easier to sink the jobs. 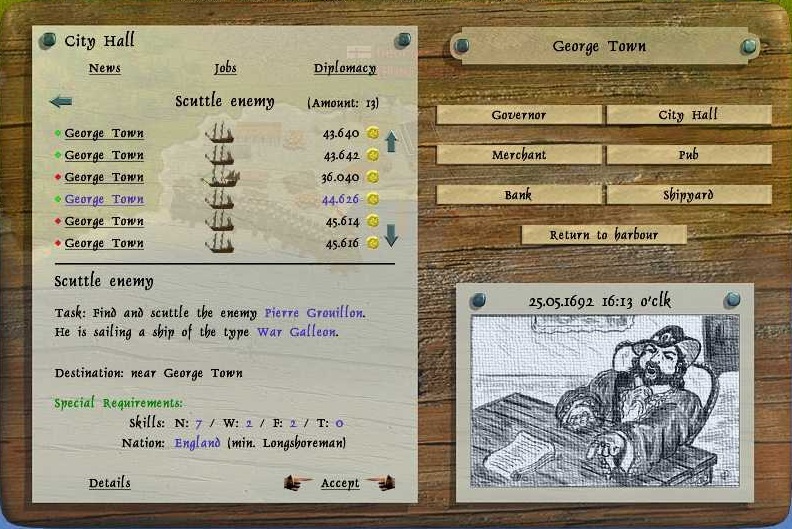 You can use Barque, Fluyt, Frigate, Fast Galleon or War galleon to sink the scuttle jobs.